For Champion Energy, lighting homes and powering life is part of what we do. But what if you didn’t have a safe, decent, affordable house to go home to? That’s where Habitat for Humanity comes in. On Saturday, October 26th Champion Energy employees volunteered with the Northwest Harris County Habitat for Humanity, roofing a house in the Hamill Crossing subdivision, in Northwest Harris County. Our community volunteers received a safety briefing from Frank, our the Habitat for Humanity “red hat” crew leader, then quickly learned about nail guns, proper shingle alignment and how to step from the ladder to the roof (a scary proposition for some of us). 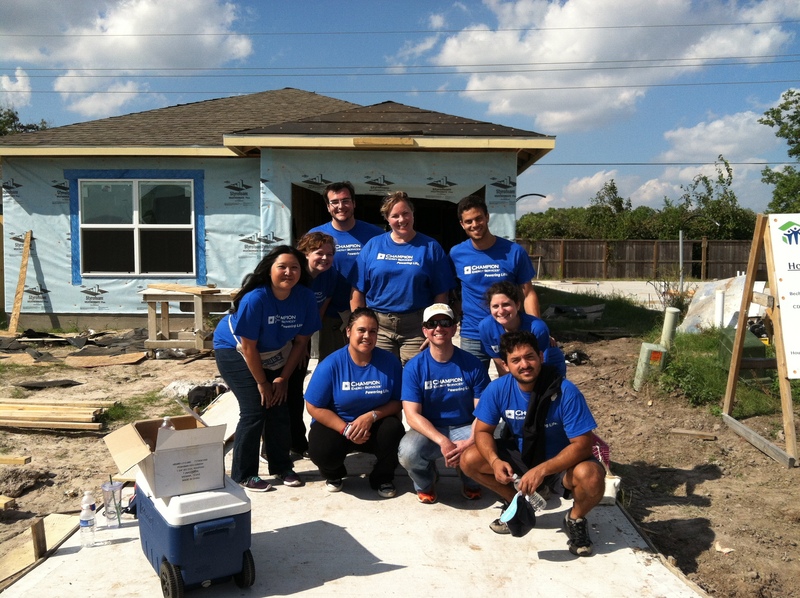 Habitat for Humanity Northwest Harris County is a Community Champion that was established in 1989 by 12 area churches as an affiliate of Habitat for Humanity International. The organization is a non-profit, faith based, volunteer driven organization dedicated to eliminating substandard housing. Since its inception Habitat Northwest Harris County has built more than 200 homes, providing housing for more than 800 individuals. Champion Energy will continue our partnership with Habitat for Humanity and will work on another Habitat home in November. This entry was posted in Community and tagged Champion Energy, community, community champions, employees, habitat for humanity, volunteering on October 29, 2013 by Champion Energy.